Gary Springer of Carnesville GA, a subscriber to Hummingbird Hobnob, hung a yellow blanket over a deck railing in 2002 and noticed that the bright color appeared to get the attention of Ruby-throated Hummingbirds. 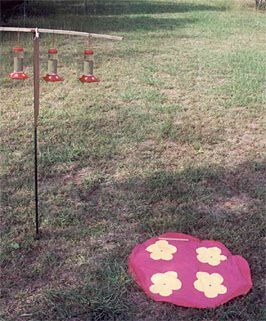 Gary suspected the blanket might serve as a "super-stimulus" that attracts hummers, and went so far as to cut a piece of red cloth to make a large circle on which he placed yellow "flowers"--imitating a huge Perky-Pet feeder (photo below). With Gary's kind permission, Operation RubyThroat: The Hummingbird Project is inviting hummingbird fanciers in the U.S. and Canada to follow his lead by participating in the Hummingbird Super-stimulus Experiment beginning in March, April, and May 2005. We especially encourage teachers and students to participate in the experiment as an extension of Operation RubyThroat. Here are the instructions for making and using a "giant fake feeder" or "hummingbird blanket" that may get the attention of hummers flying overhead, especially during spring migration. --Get a large piece of bright red material that is close to the color of the base on a Perky-Pet feeder (see photo at right). "Dollar" stores, supermarkets, and discount stores usually stock red plastic tablecloths that are inexpensive and big enough to make two fake feeders. These sheets are about 54" by 108" and can be cut in half to make two 54" square sheets. You might also choose to use red felt, cotton fabric, so something similar, but the plastic tablecloths are much cheaper and are waterproof; for the sake of consistency, whatever material is used should start out as a square between 48" and 60" on a side. --Cut the largest possible circle out of the square material. You can use a piece of string, a thumbtack, and a felt tip marker to make a drawing compass big enough to inscribe the circle, or you can just rough it out freehand. --Find some material that approximates the yellow of the fake flowers on Perky-Pet feeder (above right). This material may be a little harder to find, although the "dollar" stores do sometimes carry car cleaning cloths that are bright yellow and about the right size. They are made of cotton, however, and aren't waterproof. If you can find yellow plastic material--we've seen place mats that are the right color--it might work better. --Cut out four disks 12" in diameter from the yellow material. 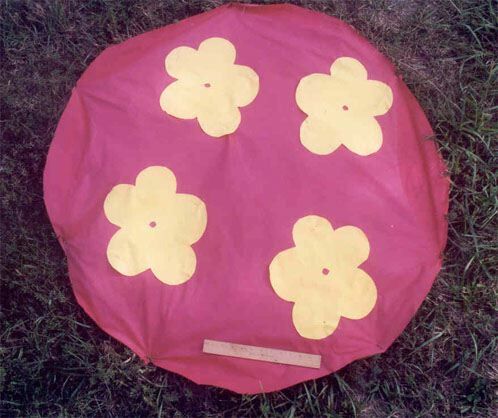 You may want to replicate the actual "petal" shape of the fake flower, but a simple 12" circle will be fine. Cut a 1" round hole from the center of each yellow disk to mimic the feeding port. --Place the giant fake feeder--preferably on the ground--in an open spot that would be visible from above as hummingbirds fly over during migration. (Hummers usually fly no higher than tree-top height.) The set-up could be on a front lawn, driveway, back deck, picnic table or other elevated structure, or even a house roof. (Since the object of the experiment is to attract migrant hummingbirds flying overhead, the fake feeder should not be hung in a vertical situation.) You may need to weigh down the red disk with rocks--or duct tape or wire pegs made from coat hangers--so it doesn't blow away in the breeze. --Hang a real hummingbird feeder containing 4:1 water:sugar mix so that it is at the edge of the red disk of the fake feeder (left). You might use a shepherd's crook or similar pole so that you can place the real feeder just where you want it, although other methods of hanging will be okay. Your real feeder does not have to be a Perky-Pet feeder. For instructions on preparing the 4:1 sugar water mix and how to maintain your feeder, see Hummingbird Feeders. 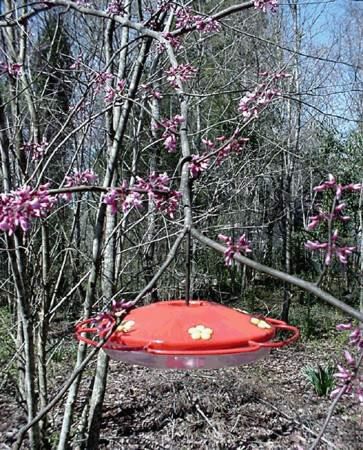 --Ideally, the real feeder at the edge of the red disk should be the only real feeder in your feeding area, but we've decided not to be restrictive on the number of feeders you use around the disk or in your yard or school campus. Besides, you may already have some flowering plants that serve as food sources. --You may need to bring in your giant fake feeder on rainy or really windy days; just put it back out a soon as the weather improves. --Feel free to use more than one fake feeder/real feeder set-up if your location warrants. --Again, the purpose of the giant fake feeder is to get the attention of spring migrant hummers as they pass over your yard or school campus. We have no idea whether the strategy will work, but it'll be a fun way to make observations about hummingbirds as they arrive in 2005. Date when you terminate the Hummingbird Super-stimulus Experiment 2005 at your school or home. You will want to start your experiment about a week before the time that spring migrant hummingbirds normally begin to return to your area. You may be able to determine these dates by referring to your notes from previous years or by consulting with other knowledgeable hummingbird experts in your city or state. (Refer also to Hummingbirds of North America by Sheri L. Williamson, 2001.) In the case of Ruby-throated Hummingbirds (RTHUs)--the species of greatest interest to Operation RubyThroat--migrants begin appearing in the Gulf Coast states about 1 March, so if you live there you'll want to put out your fake feeder/real feeder set-up as early as the last week in February; many migrants won't arrive there until much later, however, so even mid-March isn't too late to start in the Gulf Coast states. Please report the results of your efforts with the Hummingbird Super-stimulus Experiment 2003 to PROJECTS; data should be submitted by 1 June 2003. Questions you may have can also be submitted to that address. NOTE TO GLOBE SCHOOLS: Teachers and students who are involved in Operation RubyThroat through The GLOBE Program may include comments about "fake feeder" results in the metadata section(s) of their on-line data sheet(s). Below are suggested start dates for the U.S. and Canada; these are also the dates when Operation RubyThroat suggests you put out at least one real hummingbird feeder each spring (also see Migration Map).Note that RTHUs often arrive earlier in coastal areas than further inland, and that the dates below are approximations based on typical first arrival dates for RTHUs. Remember also that very small numbers of RTHUs are known to overwinter at various U.S. locations, especially along the Atlantic and Gulf Coasts; the Hummingbird Super-stimulus Experiment 2005 aims at attracting migrants, not winter residents. For more information about Operation RubyThroat: The Hummingbird Project, please refer to its Main Page. Thanks to Gary Springer for his initial work on this initiative (originally known as the "Hummingbird Blanket Experiment"), and for supplying the photos above of his prototype "fake feeder."